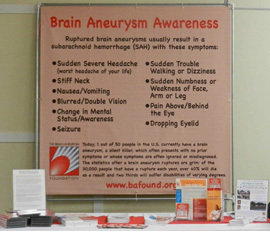 Maine Brain Aneurysm Awareness had a 2-day presentation booth at the 32nd annual Emergency Medical Services Conference held in Rockland, Maine. This event is organized by Atlantic Partners EMS and was attended by over 500 EMTs and Emergency Room personnel from all over the State of Maine. Dave McCausland manned our booth and had the opportunity to talk with first responders and EMTs about the signs and symptoms of Brain Aneurysms and the critical importance of emergency transport to the hospital. Brochures, symptom magnets and the BAF’s DVD entitled: “Early Detection of Brain Aneurysm: Life vs. Death” were given out. In turn, this 20-minute video will be viewed by many EMS crews throughout the state as part of their ongoing training. It was gratifying to hear most EMT’s were aware of Brain Aneurysms as part of their training on “Stroke”. And it was encouraging to hear that recent changes to statewide protocols should result with more patients complaining of sudden acute headache - “the Worst Headache of their Life” - being transported to the hospital. 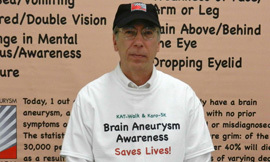 BRAIN ANEURYSM AWARENESS SAVES LIVES!